I have never been bungee jumping. I have no intention of attempting to skydive. I avoid suspension bridges at all costs. I admire the view of Niagara Falls from a safe distance. When it comes to heights, my knees buckle in fear, my eyes become all bug-like and the butterflies in my stomach grow to the size of mutant pterodactyls fighting their way back to the Jurassic era. Though my fear of heights is usually pretty paralyzing, the prospect of gliding effortlessly like the birds in the air seemed way too cool to pass up. So I put on my best brave-girl face and headed out for the adventure. 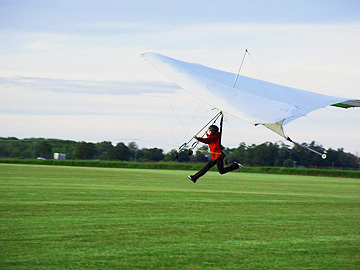 Hang gliding, just to back up a bit, has been around for over 100 years, but has grown significantly in its popularity as people have come to understand more about the science of flight. 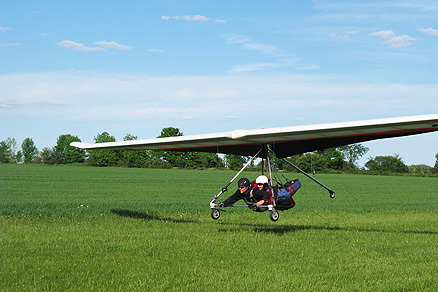 This air sport has its pilot suspended beneath a light, fabric-framed wing with no motor. 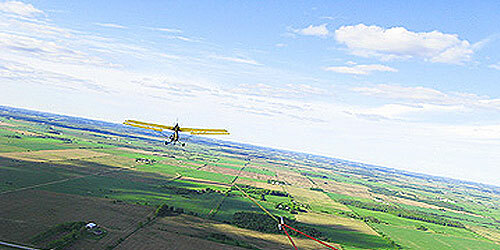 To take off, the glider has to either launch from a hill or be towed from the ground by a small plane and then released at the right height. 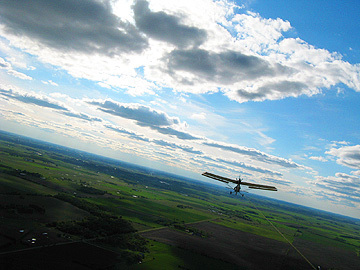 The essence of hang gliding involves moving forward while continually descending, unless the pilot can find columns of rising warm air—known as thermals—which allow the glider to stay airborne for many hours. Hang gliders have been recorded at reaching heights of over 10,000 feet and can cover hundreds of kilometres in distance. 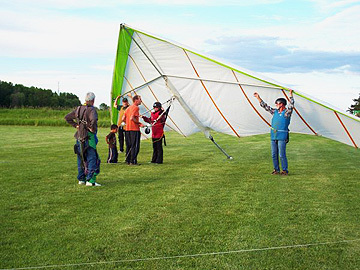 Mark Dowsett and Ryan Wood are co-owners of a hang gliding organization called Instinct Windsports (connected to SOGA—Southwestern Ontario Gliding Association), which provides a variety of courses and equipment to introduce aspiring pilots to the sport. They became the willing teachers to Faze’s reluctant student of the sky. Strange as it is for someone with a fear of heights, I know I had similar dreams of such easy flight as a child and still do sometimes. After talking with both of them about their first experiences, I start to think that maybe I was meant to be airborne after all. And now here comes my moment of truth: the first flight. For those who are just interested in experiencing the thrill of the ride, Instinct Windsports offers a straightforward tandem flight where you are taken up by an instructor who can show you how it’s done. Ryan explains all of the equipment to me and what we will be doing up in the air. I listen and nod seriously, my eyes beginning to bug-out. Before I know it, I am strapped in above Ryan and looking down the long, grassy runway that will lead us onward and upward. The plane kicks into motion and suddenly we are speeding down the lane and gently lifting off the ground. Screaming a little inside, I dare to look down below me; the view is indescribable. 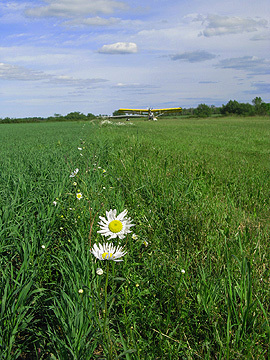 From my cocoon under the hang glider I am privy to the entire countryside, which stretches for miles in all directions. Everything that you crane to see out of the tiny window of a commercial plane is wide open to feast your eyes upon: farm fields laid out in a checkerboard pattern, rivers and lakes winding their way across the map and clouds literally at eye level. The screams inside my head subside and there is just the pure peace of the moment. The plane towing us brings us up to a height of about 2,500 feet and Ryan releases the cord that connects us to the motorized vehicle. He takes control of the metal bar in front of us and guides the hang glider gently through the sky. There is a part of me that is freaked out thinking about exactly where we are, without any piece of machinery to keep us from falling. But from that height, the movement of the glider seems slow and steady in a strangely calming way. I remind myself to not be so reliant on technology and just enjoy the flight. It isn’t long before Ryan has me take hold of the bar that controls the glider and shows me how to shift my body in the direction I want to go. I am flying solo—well, kind of. All too soon, it’s time to land and Ryan takes back the controls to glide gracefully back to earth. As we get closer to the ground, I suddenly realize how fast we were actually going, but, funny enough, it isn’t scary anymore—it’s exhilarating! While more of the Faze team clamours over for their turn in the sky, I head over to the location where Mark is waiting to give me my scooter tow lesson. In this field, they have set up a pulley contraption controlled by a stationary scooter that will allow them to teach me the fundamentals of solo hang gliding, while I’m only 10 or 15 feet in the air. If I were to continue with the lessons, they would gradually put me higher in the air, practicing turning and landing until I was ready to release the cord and fly around on my own. “It normally takes about five or six lessons (three hours each) to get a novice pilot rating, where [you] can comfortably execute a flight from altitudes over 1,000 feet,” Ryan tells me. It’s a bit exhausting to run both on the ground and in the air during the lesson, as the glider dips and rises, but I am void of fear and get the feeling of being in control of the flight—rather than just going for the ride. Overall, the experience that I had hang gliding, both the tandem flight and the scooter lesson, was incredible. I never, not in a million years, thought I would be capable of doing something like this—a frequent feeling, according to Ryan. “The most common misconception is that the sport is ‘extreme,’ meaning that it requires exceptional skill or risk-taking. Although the experience of free flight is awe-striking, hang gliding is a sport that everyday people can easily learn and safely enjoy. In fact, a hang glider is more reliable, stronger and easier to control than any other type of aircraft,” he says. Well, I guess you could say he made a believer out of me. I cannot wait to be up in the sky again. Find out more at instinct.pro and don’t forget to pick up Faze Issue #36 or more hang gliding pics!